I had a very hectic month – first the kids came back from college, then during the Holiday season we either met up with friends or invited people over for dinner and then in the new year our family took a vacation to Turkey. 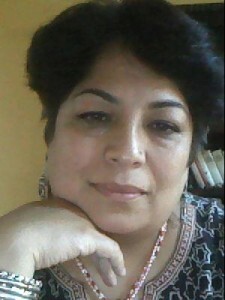 This active social and travel life meant that I was either eating out at restaurants (which is usually heavy food) or at friends’ place – which too meant wonderfully delicious but usually rich and heavy food. Of course, in Turkey we ate delicious food but clearly I ate too much sugar (Baklava and Turkish Delights in a billion flavors were hard to resist). I enjoyed every minute of the past month but now I think my body is paying a price for it – I am exhausted from all the travel (jet-lag) and I definitely need to eat some healthy light meals to back to some normalcy. To purge myself of the excesses of the past month, I have started on an intense exercise and also once a day I am going to eat a raw meal. 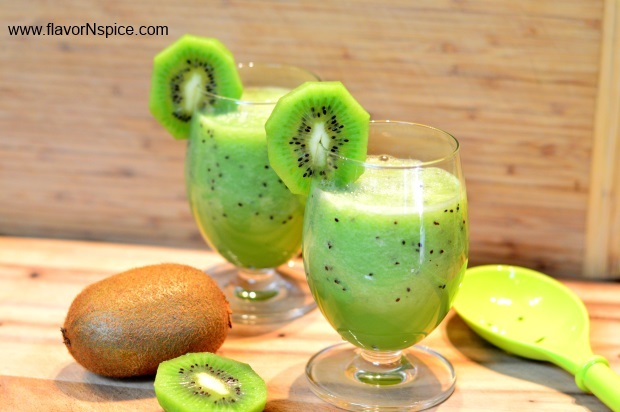 In pursuance of this raw meal, today I made a smoothie with Kiwi and Cantaloupe. It was the easiest thing to make – with just four ingredients and the whole thing took 5 minutes to make. The smoothie was delicious and refreshing and if I can keep up with this regimen, I’ll be bursting with energy pretty soon I guess! 5. ½ cup of water (I needed this to get the blender working but if you have a Vitamix or something similar, you won’t need any water). 1. 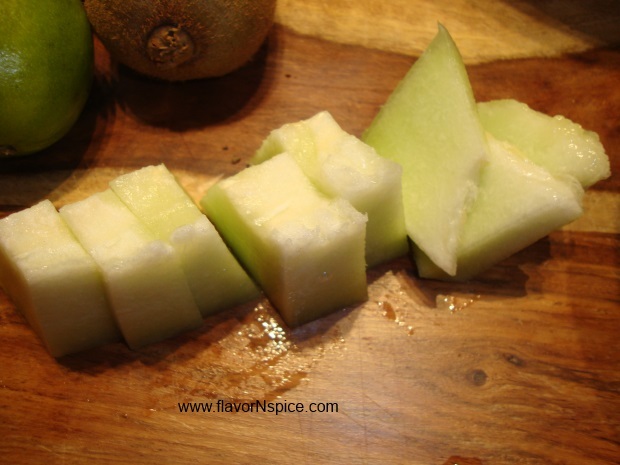 Cut the Honeydew melon in half and peel it. Remove the seeds and cut the flesh into bite sized pieces. 2. 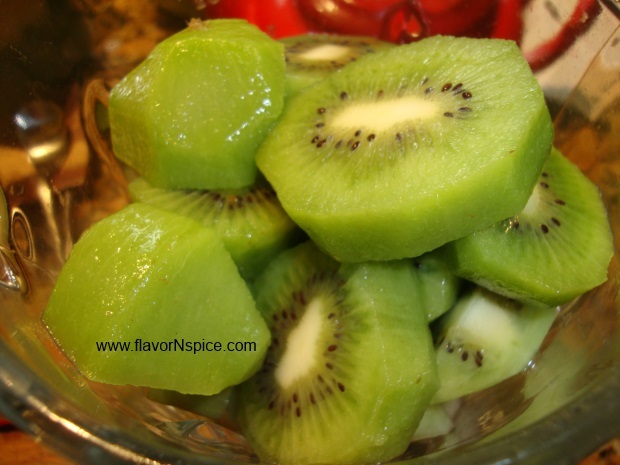 Peel the Kiwis and cut them in bite sized pieces. 3. 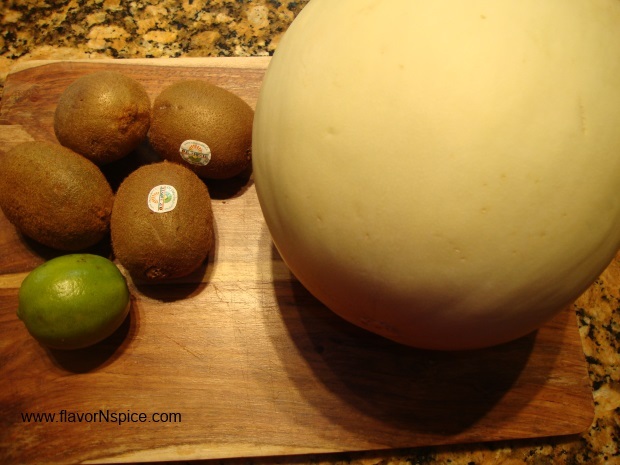 Place the Cantaloupe pieces and the Kiwi pieces in a blender and add water (if needed). 4. Juice half a lemon into the blender. 5. 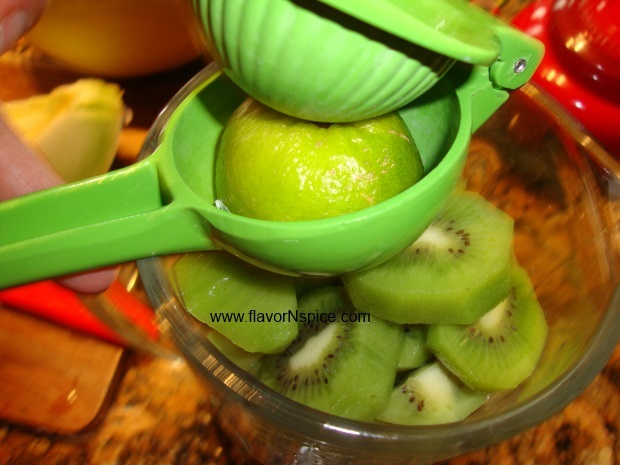 Add the honey to the fruit and blend everything till it becomes smooth. 6. If you’d like the smoothie to be cold, you can also add some ice to the blender. I preferred it to be not-too-cold because at the peak of winter, I didn’t want to be drinking something cold. 7. 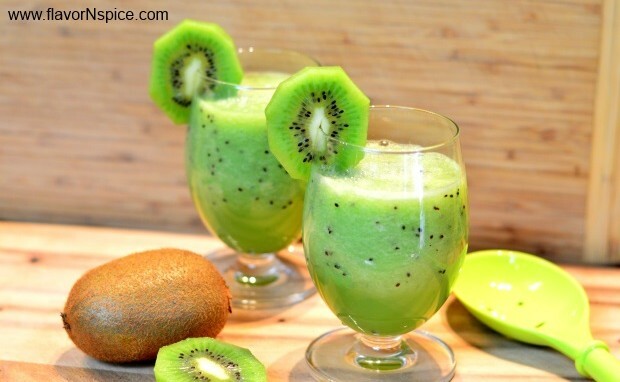 Pour the smoothie into serving glasses and garnish with a slice of Kiwi. Enjoy! It was delicious Shilpa 🙂 And this morning I woke up to a notification from Foodgawker that they accepted this photo and that made my day!!! Thank you Cindy 🙂 I appreciate the feedbackC!! !